Alex Furtado ’19 (in background) talks to a visitor about her business venture. A brand new venture opened at 930 Main Street on a Sunday in late February, and Clark students marked the occasion with excitement, music by Olivia Frances ’19, refreshments, and a brush of innovation. The day also drew neighborhood patrons, who came in on two, and even four feet (yes, even puppies stopped by). Margarita Perez-Maza ’22 launched a jewelry business called Margaretes. The Clark Collective — with a dash of ingenuity and a fresh coat of paint — now co-occupies the space with The Community Thrift Store. The new venture combined the idea of a secondhand store with the concept of a curated boutique marketplace, much like a popular destination in Worcester’s Canal District. Indeed, one visit to Crompton Collective was all it took for Teresa Quinn, a newcomer to campus who now serves as the Innovation and Entrepreneurship program manager, to envision the space as a hub where Clark can encourage and support dozens of student entrepreneurs who wish to publicly test their business products and concepts with little commitment and even less overhead. Quinn decided to significantly reduce the Thrift Store’s inventory during the fall semester, providing numerous opportunities for community members and loyal customers to fill bags and plastic storage bins with merchandise for $1. She also surveyed the Clark community and gathered responses from more than 125 students, faculty, and staff, who shared how often they visited the store and provided details about their purchases. 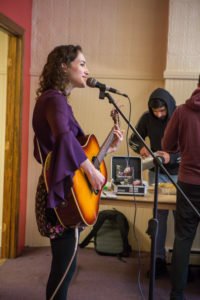 Singer-songwriter Olivia Frances performs at the event. An entrepreneur in her own right, Frances entered Clark as Olivia Schwartz ’19, and often uses her stage name. Quinn said students in her Student Run Ventures course, along with store manager Alika Gillard ’19, who will complete her master of business administration in May, were instrumental in helping with the redesign. Krishna Raj Naithani ’19 took the lead with publicity for the grand opening. 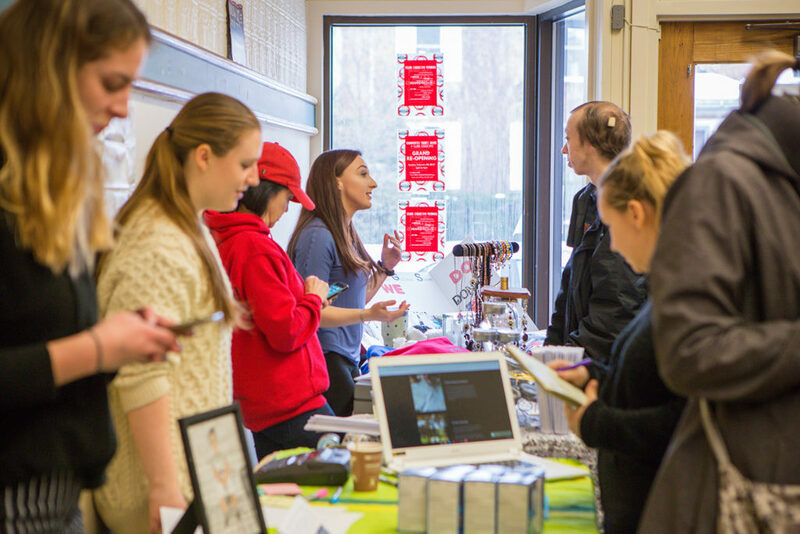 According to Quinn, Gillard has been “pivotal in both bringing student vendors together and directing the Thrift Store staff,” which includes entrepreneurship students Margarita Perez-Maza ’22 and Eric Cane ’23. 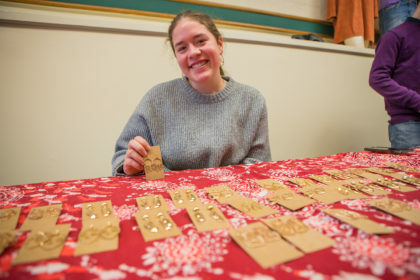 Perez-Maza was one of the first students who set up on the day the Clark Collective opened, to sell her handmade earrings and other jewelry. 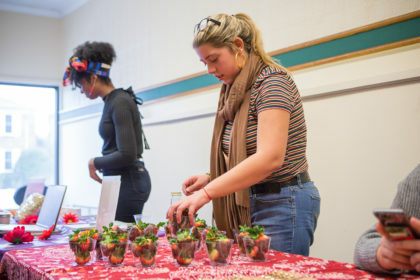 Amanda Quiñones ’20, right, sells chocolate-covered strawberries for a business launched by her friend Jose Castro ’21. Left, Kayla Falconer ’20 displays her skincare line, based on her grandmother’s formula. Kayla Falconer ’20, a psychology major with a double minor in entrepreneurship and management, also “ventured” out as a vendor at the opening. Falconer said she found inspiration through her involvement in Shirt Shack, a business founded by Clark students Valerie Diaz ’20 and Nana Lokko ’19 (read ClarkNow story about that business). With guidance from Professor John Dobson and tips she learned in a course on The Art of the New: Entrepreneurship, Falconer launched Rude Gyal Skincare, a line of moisturizers based on her grandmother’s formula and sourced by her family in Jamaica. Since 2010, The Community Thrift Store has helped reduce the University’s net landfill impact through donations and provided a sustainable, affordable shopping alternative to members of the Clark and Main South communities. The store was the brainchild of Clark alumni Rachel Gerber ’11 and Alexa Lightner ’11, who won a grant from the Innovation and Entrepreneurship program’s U-Reka! Big Idea Contest. Originally conceived to reduce move-out waste, the store has helped divert approximately 70 tons of unwanted items from landfill and saved customers over $100,000 off retail over the years. 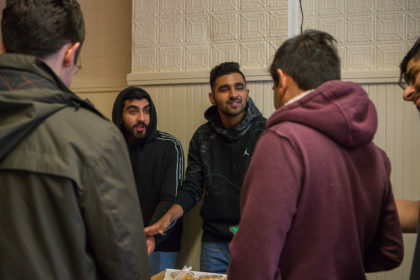 Ashar Ashraf ’20, left, and Sohail Vakalia ’19 discuss their business. Jenny Isler, director of Sustainable Clark, recalled that the store also served as the focus for a few Clark students who worked on marketing and outreach projects through Clark’s Liberal Education and Effective Practice initiative. Isler has helped supervise more than 200 student employees, interns, and community volunteers over the years. These students contributed to the store’s success while honing their skills in finance, retail operations, community engagement, social-purpose business management, and team-building, she says. Quinn hopes Clark student entrepreneurs will see the Collective as an opportunity to connect with the public, and she wants students to take advantage of the opportunity to use the 12 available booths to start their own businesses, get their feet wet, and practice the skills they’ve acquired in their entrepreneurship, business, and management classes. Quinn said the store will still continue to work to reduce the University’s net impact through donations, and will carry a limited supply of second-hand items so loyal patrons who are die-hard thrifters can still find treasures in the $1, $2, and $3 bins. Most importantly, she hopes members of the Clark and Main South communities will join her to rally around what might wind up being a “priceless” opportunity to support and give wings to the University’s young student entrepreneurs. The Collective will be open regularly on Tuesdays, Wednesdays, and Thursdays from 4 p.m. to 7 p.m., and on weekends.